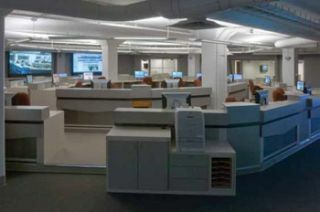 Electrosonic installed two Planar Clarity Margay video walls on both the north and south sides of Oklahoma’s Emergency Operations Center surrounding a bullpen-style main area featuring 22 workstations. Video walls represent both a figurative and literal bright spot in the systems integrator’s world. They are becoming more accessible, more widely used, technology is developing, business opportunities are growing, and new players are entering the scene. Norder also believes upgrading security operations centers is a business opportunity to capitalize on with video wall processors. The integration firm Electrosonic seized on one such prospect with a state emergency operations center in Oklahoma City. The former 1950s bomb shelter was outfitted with four two-by-two video walls of Planar Clarity Margay cubes, and a few smaller installations were made in auxiliary rooms. Two computers using a web interface that interacts with an AMX system controls the equipment. The University of Colorado is one academic institution that has taken advantage of the technology’s budget-friendlier development by installing a Planar Clarity Matrix LCD video wall system in a newly built Center for Community Dining. The data that processors are receiving are coming from more sources than before. “Video is going out onto the cloud and out into the network,” Jackson explained. Instead of just displaying digital video, video wall processors can now monitor native IP signals too. Harris increasingly deals with IP -based content over traditional video. The company’s recent product releases demonstrate this hybrid technology focus on taking in direct IP feeds without having to convert the signals to base band video. RGB’s Norder also identified IP support as an imperative feature for today’s processors—along with HD CP support, which Electrosonic recognizes too as a developing area. Despite the growing opportunities in video wall processing, AV consultants and integrators face challenges in selecting and implementing processors. “There is no one product solution; therefore, to match the requirements of different projects, it is important to have access to all the different manufacturers’ product lines,” Electrosonic’s James said. “Knowing the limitations of each system is key to choosing a system that meets the project requirements and satisfies the client,” Rajcula added. Lindsey Snyder is assistant editor of SCN. The Extron Quantum Series consists of video wall processing systems that deliver high performance and reliable multi-image presentations in demanding, mission-critical environments. They feature dedicated graphics and video processing, plus a highspeed video bus that maintains real-time performance under heavy input loads. The Quantum Elite is designed for large video walls up to 28 screens and larger, while the Quantum Connect is ideal for small- to medium-sized video walls up to 14 screens. Both video wall processors are card cage designs that support various combinations of 12-input video cards, dual DVI /RG B input cards, and dual DVI /RG B output cards. They can display up to 128 windows per output and feature a dedicated highbandwidth video/graphic bus, maintaining real-time performance even under heavy loading. The VP -423 computer graphics ProScale video wall scaler can be used to create a video wall of up to 4x4 displays. Each display in a VP -423 requires a dedicated VP -423 scaler. The unit reaches a maximum resolution of 1080p. A looping input feature allows users to daisychain the source input to the next unit. The video wall size menu is selectable up to 4x4. A separate unit is required for each display of the video wall matrix. Two units can be rack mounted side by side in a 1U rack space with an optional universal rack adapter. The Harris HV iew SX Hybrid multiviewer is designed for hybrid applications with routing and monitoring of both traditional and IP signals. Combining baseband and broadband monitoring, graphics, and optional integrated test and measurement tools for baseband signals in a single chassis, the multiviewer/ router solution is built to reduce integration costs and enable a more efficient use of space in monitoring environments. The HV iew SX Hybrid multiviewer resides within the output section of the Harris Platinum router frame, and is available as either a multiviewer-only or multiviewer/router integrated solution. This high-definition digital video processor accepts up to eight source signals and displays them in up to eight scalable video windows. Input and output resolutions reach up to 1920x1200 for RG B and DVI signals while supporting 1080i and 1080p HD TV. The DVPHD -PR O was designed for network operation centers, command and control centers, and large entertainment venues. Daily operation and system setup is performed from the front panel LCD or using built-in web pages displayed on any computer. A sync-sensing feature enables the DVPHD -PR O to detect the presence of a sync signal and identify the source and type of video signal while scaling the signal to the appropriate resolution. These display processors employ a multi-scaler, parallel processing architecture to present up to 30 windows on up to 12 screens. Regardless of resolution and number of inputs and outputs, there is an abundance of horsepower, even with resolutions up to 1920x1200p, HD to 2048x1080p, 60 and 4K resolutions to 4096x2160. Visual sources may include video, analog or digital PC graphics and HD /3G-SDI interfaces. MediaWalls fully support HD CP, allowing multiple content protected sources to be shown anywhere and at any size on the video wall. User defined layouts are saved in up to 50 presets. The Christie TVC-500 controller was built for 24/7 applications, and is capable of simultaneously managing and displaying a variety of source inputs across as many as 12 display screens. The TVC- 500’s foundation takes full advantage of the latest display processing advances from partners such as HP and NVIDI A. Running off Windows 7, the PC-based integrated platform is managed through Christie’s MasterSuite Lite software, which simply manages sophisticated display wall projects. More than a standard a video controller, thirdparty software applications can operate directly off the TVC-500 desktop. Video or DVI /RG B inputs can be positioned anywhere on the display wall, at any size, with fast refresh rates. Up to 100 remote networked desktops can also display via high speed Gigabit ethernet. Fusion Catalyst processors perform with up to 192 Gbps internal bandwidth, which can carry various video signals and drive ultra-high resolution displays. They handle up to 376 analog or streaming SD video inputs, up to 94 DVI /VG A or HD component video inputs, and up to 96 graphic outputs. A drag-and-drop user interface controls the system. The Fusion Catalyst handles dual-link DVI on both input and output, and it is appropriate for large and small projects. The C2-6104A allows four sizeable windows to be positioned anywhere across the video wall with color borders and source labeling if required. The single DVI output signal can be fed into four scalers via a distribution amplifier to allow full picture-in-picture capability. Composite video, YUV , YP bPr, RG B, and DVI sources can be accommodated and scaled to the DVI output. Image windows can be resized and positioned anywhere on the 2x2 video wall. The variable shrink and zoom function allows any portion of the full image source to be visible within the picture-in-picture. Logos and images are stored in the unit’s memory and can be placed anywhere on the screen. The keying feature allows for any logo or image to be keyed with variable layer, priority, and transition control, along with 50 presets, so various configurations can be recalled and displayed. The StretcherPro takes any DVI -D source and stretches it along four VG A or DVI displays. The controller supports high resolution of 1920x1200 for single link DVI -D. The four screens all display a quarter of the image in a two by two format using real time scaling. Without the complexity of external computer control or setup, SmartAVI ’s StretcherPro is an entry-level display wall solution. A 32-port video wall system can be run into a StretcherPro unit for a 128-screen total. The unit does not require any software or additional hardware to be installed. The Planar Clarity VCS is a flexible video wall controller designed to capture, display, and manage visual sources on a video wall. Featuring a compact design and strong form factor, Clarity VCS supports a range of visual inputs and can drive video walls made of up to 16 high-resolution displays. Visual sources can be placed and resized individually anywhere on the video wall using Windows 7-based software. The entire video wall can revert to a preset layout of windows with the click of a mouse.